Regency England. The age of Napoleon and Jane Austen, of Beau Brummel and Lord Byron. Ladies wear filmy dresses and dampen their petticoats, while gentlemen duel with pistols at dawn and agonize over the cut of a coat. Fortunes are won and lost at the turn of a card, a decades-old war has turned Europe into a ravaged battlefield, and in London, a child of six can still be hanged for stealing a handkerchief. This is the world of Sebastian St. Cyr, Viscount Devlin. Heir to an earldom, disillusioned Army officer, latter day knight errant. A master of disguises. Sebastian moves easily from the ballrooms of Mayfair to the rookeries of St. Giles, from the exclusive men's clubs of St. James's to the dangerous docks of the Thames. 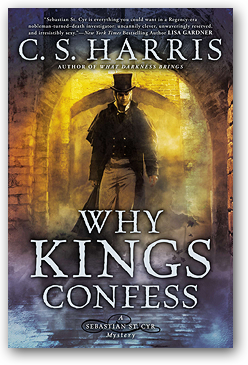 "Fans of this long-running series will revel in the meticulous historical detail along with the twists and turns of a case that reveals the vast inequality in Regency England." When sadistic young Lord Ashworth is found brutally murdered in his silk hung, blood-soaked bed, Sebastian St. Cyr, Viscount Devlin, is called in to help catch the killer. Just seven months before, Sebastian had suspected Ashworth of aiding in the kidnapping and murder of a string of vulnerable street children. But Sebastian was never able to prove Ashworth's complicity. Nor was he able to prevent his troubled, headstrong young niece, Stephanie, from entering into a disastrous marriage with the dangerous nobleman. With mounting evidence—from a small bloody handprint to a woman's silk stocking—suggesting that Ashworth's killer was a woman, Sebastian must delve deep into the murdered man's debauched life and unravel the treacherous schemes of a deadly Russian duchess to keep Stephanie from being convicted of murder. And as the allied armies march on Paris and Napoleon's end draws near, Sebastian races to confront a chilling, ruthless killer who will stop at nothing and spare no one. As a cruel winter holds the city in its icy grip, the bloody body of a beautiful young musician is found half-buried in a snowdrift. Jane Ambrose's ties to Princess Charlotte, the only child of the Prince Regent and heir presumptive to the throne, panic the palace, which moves quickly to shut down any investigation into the death of the talented pianist. But Sebastian St. Cyr, Viscount Devlin, and his wife Hero refuse to allow Jane's murderer to escape justice. The gruesome murder of a young boy takes Sebastian St. Cyr from the gritty streets of London to the glittering pleasure haunts of the aristocracy . 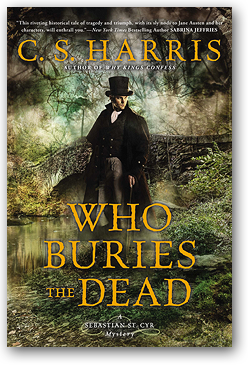 . .
Sebastian St. Cyr, Viscount Devlin, is no stranger to the dark side of the city, but he's never seen anything like this: the brutalized body of a fifteen-year-old boy dumped into a makeshift grave on the grounds of an abandoned factory. One of London's many homeless children, Benji Thatcher was abducted and tortured before his murder—and his younger sister is still missing. Few in authority care about a street urchin's fate, but Sebastian refuses to let this killer go unpunished. Uncovering a disturbing pattern of missing children, Sebastian is drawn into a shadowy, sadistic world. As he follows a grim trail that leads from the writings of the debauched Marquis de Sade to the city's most notorious brothels, he comes to a horrifying realization: someone from society's upper echelon is preying upon the city's most vulnerable. And though dark, powerful forces are moving against him, Sebastian will risk his reputation and his life to keep more innocents from harm . . . 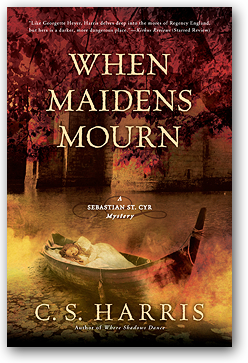 The tragic death of an enigmatic young stranger draws Sebastian St. Cyr and his wife, Hero, into a perilous tangle of passion and intrigue in this breath-taking new mystery from C. S. Harris. Sebastian St. Cyr, Viscount Devlin, has come to this seemingly peaceful Shropshire village to honor a slain friend and on a quest to learn more about his own ancestry. But when the body of a lovely widow is found on the banks of the River Teme, a bottle of laudanum at her side, the village's inexperienced new magistrate turns to St. Cyr for help. Sebastian quickly realizes that Emma Chance did not take her own life. Less easy to understand is exactly how she died, and why. For as Sebastian and Hero soon discover, Emma was hiding both her true identity and her real reasons for traveling to Ayleswick. Also troubling is the presence in the village of Lucien Bonaparte, the estranged brother of the megalomaniac French Emperor Napoleon, now held captive under the British government's watchful eye. Then Sebastian's investigation takes on new urgency when he discovers that Emma was not the first, or even the second, beautiful young woman in the village to die under suspicious circumstances. Home to a haunting, ruined monastery, Ayleswick reveals itself to be a dark and dangerous place of secrets that have festered among the villagers for decades—and a violent past that may be connected to Sebastian's own unsettling origins. As he faces his most diabolical opponent ever, Sebastian is forced to consider just how far he's willing to go in order to destroy a killer. 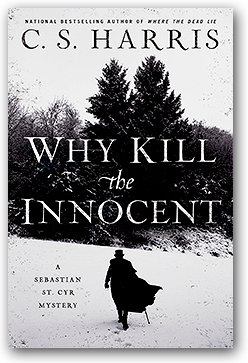 The grisly murder of a West Indies slave owner and the reappearance of a dangerous enemy from Sebastian St. Cyr's past combine to put C. S. Harris's "troubled but compelling antihero" (Booklist) to the ultimate test in this taut, thrilling mystery. The vicious decapitation of Stanley Preston, a wealthy, socially ambitious plantation owner, at Bloody Bridge draws Sebastian St. Cyr, Viscount Devlin, into a macabre and increasingly perilous investigation. The discovery near the body of an aged lead coffin strap bearing the inscription King Charles, 1648 suggests a link between this killing and the beheading of the deposed seventeenth-century Stuart monarch. Equally troubling, the victim's kinship to the current Home Secretary draws the notice of Sebastian's powerful father-in-law, Lord Jarvis, who will exploit any means to pursue his own clandestine ends. Working in concert with his fiercely independent wife, Hero, Sebastian finds his inquiries taking him from the wretched back alleys of Fish Street Hill to the royal castle of Windsor as he amasses a list of suspects who range from an eccentric Chelsea curiosity collector to the brother of an unassuming but brilliantly observant spinster named Jane Austen. But as one brutal murder follows another, it is the connection between the victims and ruthless former army officer Sinclair, Lord Oliphant, that dramatically raises the stakes. Once, Oliphant nearly destroyed Sebastian in a horrific wartime act of carnage and betrayal. Now the vindictive former colonel might well pose a threat not only to Sebastian but to everything—and everyone—Sebastian holds most dear. 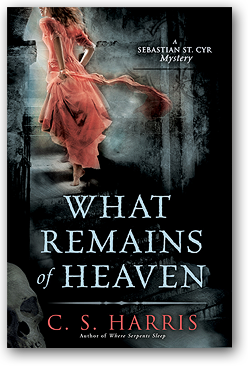 The gruesome murder of a young French physician draws aristocratic investigator Sebastian St. Cyr and his pregnant wife, Hero, into a dangerous, decades-old mystery as a wrenching piece of Sebastian's past puts him to the ultimate test. When a badly injured Frenchwoman is found beside the mutilated body of Dr. Damion Pelletan in one of London's worst slums, Sebastian finds himself caught in a high-stakes tangle of murder and revenge. Although the woman, Alexi Sauvage, has no memory of the attack, Sebastian knows her all too well from an incident in his past—an act of wartime brutality and betrayal that nearly destroyed him. As the search for the killer leads Sebastian into a treacherous web of duplicity, he discovers that Pelletan was part of a secret delegation sent by Napoleon to investigate the possibility of peace with Britain. Despite his powerful father-in-law's warnings, Sebastian plunges deep into the mystery of the "Lost Dauphin," the boy prince who disappeared in the darkest days of the French Revolution, and soon finds himself at lethal odds with the Dauphin's sister—the imperious, ruthless daughter of Marie Antoinette—who is determined to retake the French crown at any cost. 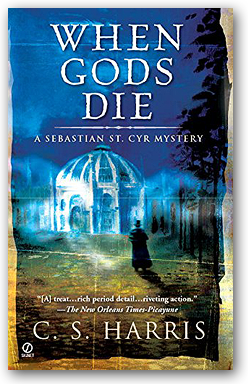 The death of a notorious London diamond merchant draws aristocratic investigator Sebastian St. Cyr and his new wife Hero into a sordid world of greed, desperation, and the occult, when the husband of Sebastian's former lover Kat Boleyn is accused of the murder. After a long night spent dealing with the tragic death of a former military comrade, a heart-sick Sebastian learns of a new calamity: Russell Yates, the dashing, one-time privateer who married Kat a year ago, has been found standing over the corpse of Benjamin Eisler, a wealthy gem dealer. Yates insists he is innocent, but he will surely hang unless Sebastian can unmask the real killer. For the sake of Kat, the woman he once loved and lost, Sebastian plunges into a treacherous circle of intrigue. Although Eisler's clients included the Prince Regent and Napoleon, he was a despicable man with many enemies and a number of dangerous, well-kept secrets—including a passion for arcane texts and black magic. Central to the case is a magnificent blue diamond, believed to have once formed part of the French crown jewels, that disappeared on the night of Eisler's death. As Sebastian traces the diamond's ownership, he uncovers links that implicate an eccentric, powerful financier named Hope and that stretch back into the darkest days of the French Revolution. When the killer grows ever more desperate and vicious, Sebastian finds his new marriage tested by the implications for his first love, especially when he begins to suspect that Kat is keeping secrets of her own. And as matters rise to a crises, Sebastian must face a bitter truth—that he has been less than open with the fearless woman who is now his wife. Tales of King Arthur and the Lady of Shalott provide inspiration for this latest gripping installment in the Sebastian St. Cyr mystery series when, just four days wed, the aristocratic investigator and his fiercely independent bride, Hero Jarvis, find themselves caught up in a twisted intrigue of ancient legends and a deadly family curse. Sebastian's plans to escape the heat of London for a honeymoon are shattered when the murdered body of Hero's good friend, Gabrielle Tennyson, is discovered drifting in a battered boat at the site of a long-vanished castle known as Camlet Moat. A beautiful young antiquarian, Miss Tennyson had recently provoked an uproar with her controversial identification of the island as the location of Camelot. Missing and presumed also dead are Gabrielle's two young cousins, nine-year-old George and three-year-old Alfred. Still struggling to define the nature of their new marriage, Sebastian and Hero find themselves occasionally working at cross-purposes as their investigation leads from London's medieval Inns of Court to its seedy back alleys, and from grand country homes to rural enclaves where ancient Celtic beliefs still hold sway. 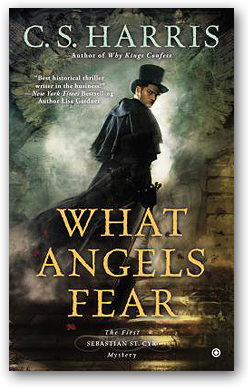 As he probes deeper, Sebastian also discovers dark secrets at the heart of the Tennyson family, and an enigmatic young French lieutenant with a dangerous, mysterious secret of his own. Racing to unmask a ruthless killer and unravel the puzzle of the missing children, Sebastian and Hero soon find both their lives and their growing love for each other at risk as their investigation leads to Hero's father, who is also Sebastian's long-time nemesis... and to a tall, dark stranger who may hold the key to Sebastian's own parentage. "I love this series. It has it all: romance, political intrigue, dark humor, and memorable characters." How do you set about solving a murder no one can reveal has been committed? That's the challenge confronting C.S. 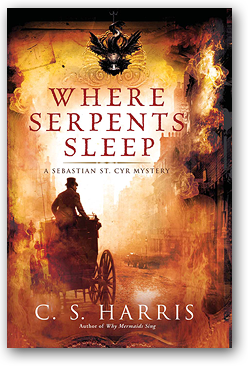 Harris's aristocratic soldier-turned-sleuth Sebastian St. Cyr when his friend, surgeon and "anatomist" Paul Gibson, illegally buys the cadaver of a young man from London's infamous body snatchers. A rising star at the Foreign Office, Mr. Alexander Ross was reported to have died of a weak heart. But when Gibson discovers a stiletto wound at the base of Ross's skull, he can turn only to Sebastian for help in catching the killer. Described by all who knew him as an amiable young man, Ross at first seems an unlikely candidate for murder. But as Sebastian's search takes him from the Queen's drawing rooms in St. James's Palace to the embassies of Russia, the United States, and the Turkish Empire, he plunges into a dangerous shadow land of diplomatic maneuvering and international intrigue, where truth is an elusive commodity and nothing is as it seems. Meanwhile, Sebastian must confront the turmoil of his personal life. Hero Jarvis, daughter of his powerful nemesis Lord Jarvis, finally agrees to become his wife. But as their wedding approaches, Sebastian can't escape the growing realization that not only Lord Jarvis but Hero herself knows far more about the events surrounding Ross's death than they would have him believe. Then a second body is found, badly decomposed but bearing the same fatal stiletto wound. And Sebastian must race to unmask a ruthless killer who is now threatening the life of his reluctant bride and their unborn child. 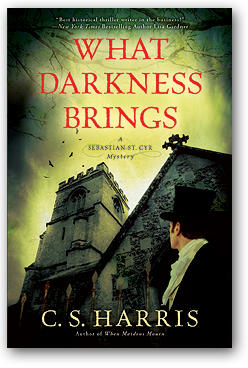 When the controversial reform-minded Bishop of London is found bludgeoned to death in an ancient crypt beside the corpse of an unidentified man murdered decades before, Sebastian St. Cyr, Viscount Devlin, reluctantly agrees to help with the investigation. To Sebastian's consternation, the last person to see the Bishop alive was Miss Hero Jarvis, a woman whose already strained relationship with St. Cyr has been complicated by a brief, unexpectedly passionate encounter. 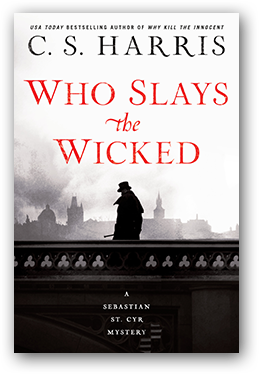 As his search for the killer leads him from the back allies of Smithfield to the power corridors of Whitehall, Sebastian must confront the well-guarded secrets of his own family's pastand a devastating truth that could ultimately force him to question whoand whathe really is. 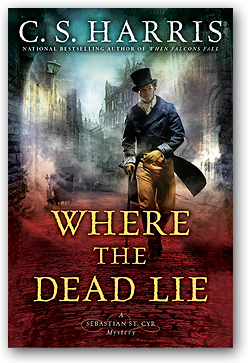 Troubled but compelling antihero Sebastian St. Cyr returns in a thrilling new mystery as he joins the daughter of his most bitter enemy in a murder investigation that uncovers layers of hypocrisy and depravity in the highest echelons of power in Regency England. The brutal slaughter of eight young prostitutes in a house of refuge near Covent Garden leaves only one survivorand one witness: Hero Jarvis, reform-minded daughter of the Prince Regent's cousin, Lord Jarvis. When the Machiavellian power broker squashes any official inquiry that might reveal his daughter's unorthodox presence, Hero launches an investigation of her own and turns to Sebastian St. Cyr, Viscount Devlin, for help. Still struggling to come to terms with the loss of his lover, Kat Boleyn, and the resultant estrangement from his father, Sebastian is at first reluctant to agree. But the callous violence of the murderscombined with the opportunity to provoke his archenemy, Jarvisprompts him to act. Working in uneasy alliance, Hero and Sebastian focus their efforts on one particular victim of the carnage: Rose Jones, the terrified nineteen-year-old girl with the unmistakable accent of a gentlewoman who died in Hero's arms. As they unravel a dangerous thread of lies and deceptions, Hero and Sebastian follow a trail of clues leading from the seedy brothels and docksides of London's East End to the Mayfair mansions of a noble family with dark secrets of its own to hide. Risking both their lives and their reputations, the two must race against time to stop a killer whose ominous plot threatens to shake the nation to its very core. A taut, richly imagined novel that will keep readers on the edge of their seats as it deepens the portrait of this dashing and charismatic sleuth. 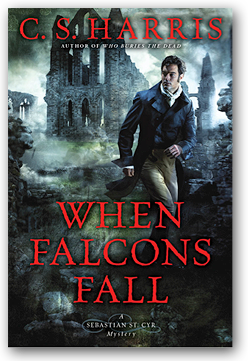 Death stalks the sons of Regency England's most powerful families. Partially butchered, with strange objects stuffed in their mouths, the bodies are found dumped in public places at dawn. When the grisly remains of the eldest son of Alfred, Lord Stanton, are discovered in Old Palace Yard beside the House of Lords, local magistrate Sir Henry Lovejoy turns to Sebastian St. Cyr, Viscount Devlin, for help. 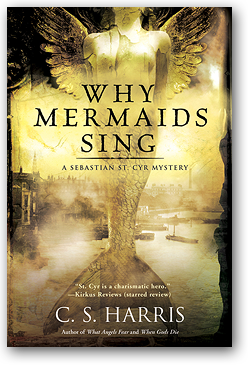 Ranging from the gritty world of London's docks to the luxurious drawing rooms of Mayfair, Sebastian confronts his most puzzlingand disturbingcase yet. With the help of his trusted allieshis young servant Tom, the Irish doctor Paul Gibson, and his lover Kat BoleynSebastian struggles to decipher a cryptic set of clues that links the scion of a banking family and a lord's heir to the son of a humble Kentish vicar. For as one death follows another, Sebastian comes to believe that the murderer has both a method and a purpose to his ritualized killings, and that the key to it all may lie in the enigmatic stanzas of a haunting poem...and in a secret so dangerous that men are willing to sacrifice their own children to keep the truth from becoming known. On a summer's evening at the Royal Pavilion in Brighton, the beautiful young wife of an aging Marquis is found dead in the arms of the Prince Regent himself. From her back protrudes a jeweled dagger that once belonged to Bonnie Prince Charlie. Around her neck lies an ancient bluestone and silver necklace said to have been worn by the Druid priestesses of Wales. Legend credited the necklace with mysterious powersuntil it was lost at sea with its last owner, the mother of Sebastian St. Cyr, Viscount Devlin. 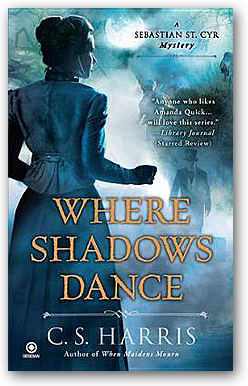 Still shadowed by rumors of his own dark past, Sebastian is lured into a dangerous investigation of both the Marchioness's death and his own mother's uncertain fate. He soon discovers that the idle, profligate Prince is not as innocent as his court handlers would have the public believe. With the aid of his lover, a celebrated actress with secrets of her own, and his new servant, Tom, Sebastian follows a twisted trail that leads from a seaside pleasure palace to the most depraved London slums, from the murdered woman's elegant townhouse in Mayfair to a medieval tavern run by an ex-slave. As he edges closer to the truth, Sebastian finds himself thrust into a world of hidden passions and disguised ambition. And when one murder is followed by another, he confronts an insidious conspiracy that imperils those nearest to him even as it threatens to bring down the monarchy. As old King George III sinks deeper into madness and the threat of social unrest and revolution haunts the privileged classes, a beautiful young woman is found raped and savagely murdered on the altar steps of an ancient parish church not far from Westminster Abbey. 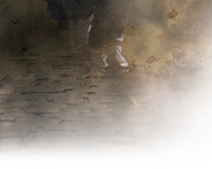 An ornate dueling pistol discovered tangled in the blood-soaked folds of Rachel York's cloak and the damning testimony of a witness both point to one man, Sebastian St. Cyr, Viscount Devlin, a brilliant young nobleman shattered by his experiences in the Napoleonic Wars. When a vicious attack during his arrest leaves a constable near death, Sebastian must run for his life. Now a fugitive, Sebastian calls upon his experience as an agent during the war to embark on a desperate quest to catch a brutal killer and prove his own innocence. Ranging from the glittering ballrooms and sedate salons of Mayfair to the squalid back alleys and fetid churchyards of St. Giles, Sebastian accumulates a band of unlikely allies, including a street urchin named Tom, an opium-eating Irish doctor, and a lovely but mysterious actress who calls herself Kat Boleyn. Years ago, Kat broke Sebastian's heart. Now she may hold the key to his salvationor doom him to destruction. For as he plunges into a world of intrigue and espionage, Sebastian discovers that Rachel York was more than what she seemed. When the twisted path leads from a French spymaster to a Machiavellian power broker, and from there to the future Prince Regent, Sebastian begins to realize that Rachel's death holds ominous implications not only for Sebastian's own family, but for the future of the British monarchy.